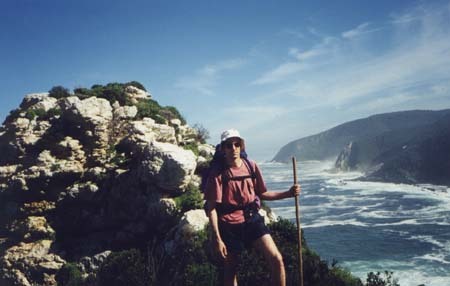 The Otter Trail, which runs for 25 miles along the coast of South Africa, is reputedly the most beautiful trail in that country, and maybe in the world. You need a permit to hike it, and the waiting period for a permit is over a year. A couple of years ago I met Elise Daniel on the Internet, she suggested forming an Otter expedition, I was interested, and she got a permit. Permits are for 12 people - the trail has sleeping huts along the way, and they accommodate 12. It turned out that Mark Daly and Dawn Hawk, two friends from Berkeley, were passing through South Africa around the same time, and they eagerly accepted my invitation to join the group. 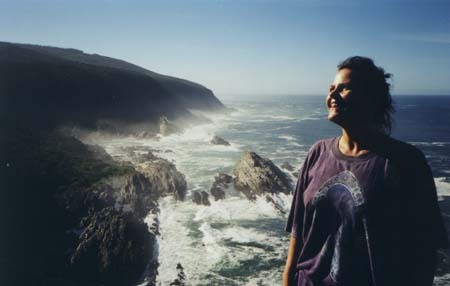 Mark, Dawn, Elise and I met in Capetown on 4/20, scaled Table Mountain as a warm-up, and drove to Elise's home in George. On 4/22 we enjoyed a pre-hike dinner with other members of the party: Sandy (a gregarious, powerful woman, into horses), Nickie and Tony (the former slender, gracious and blonde; the latter a prolific story-teller and maker of thatched roofs). 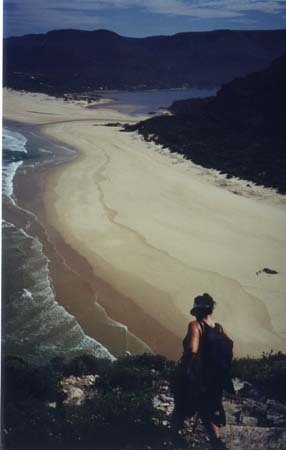 Later we would meet Andre (friend of Sandy, very Afrikaaner); 'Pik' Piccolo, a wiry man, highly spiritual and political; and Di, an energetic woman in her 50's with bad knees and ski poles, who collected plant samples for a nature group. Rounding out the group: Elise's 15-year-old daughter Carene, and Riegardt, a quiet but intense 19-year-old medical student and object of Carene's affections. The evening before (4/23) we bought rain ponchos and a gas stove at a local camping store, loaded up on meat and Biltong (shredded dried beef), and went crazy buying all sorts of food at 'Pick and Pay'. After a farewell Braai (barbeque) at the home of Elise's parents, we stayed up quite late assembling our packs, planning menus and stuffing things into myriad plastic bags. We slept, got up at the crack of 10, loaded up the car and drove to the trailhead at Storm River, stopping at the Petroport to store some of Mark and Dawn's belongings. 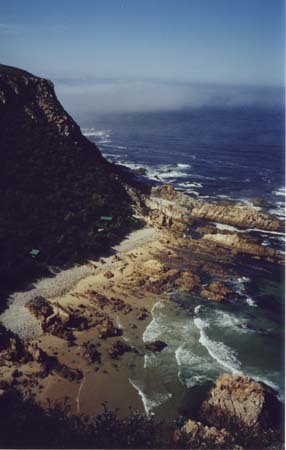 The Otter Trail threads its way along 25 miles of coastline. An immense sandstone plate is being uplifted (I think) from the ocean. 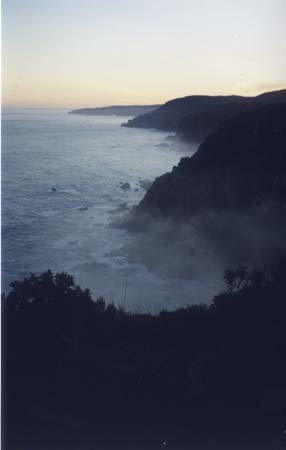 The rock is highly striated, and the layers are generally tilted to almost vertical, with planes running parallel to the coast. Occasionally layers of opaque white quartz, anywhere from inches to many feet thick, interrupt the sandstone. At the boundary of land and sea, the layers of rock form huge walls that seem to challenge the sea. The surf pounds these walls, spraying high into the air, and churning into a foamy froth that extends out hundreds of yards. It all seems to embody a titanic clash between land and sea. The jungle is wet and dense, with lots of trees and vines. The soil in the jungle is peaty. The trail through it has a springy quality, very pleasant, and there's a distinctive smell, reminiscent (to me) of roast lamb. The streams leach tannins out of this soil, and their water is caramel-colored (jet black when deep). Somehow it's safe to drink without filtering or boiling. At the mouth of each stream, fresh and salt water mix. 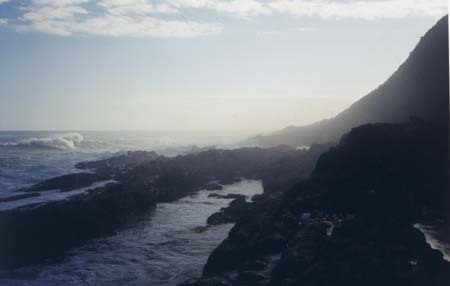 Sometimes waves from the ocean roll hundreds of yards upstream. At the larger streams, the tides become a factor and it's hard to cross at high tide - packs often get soaked. 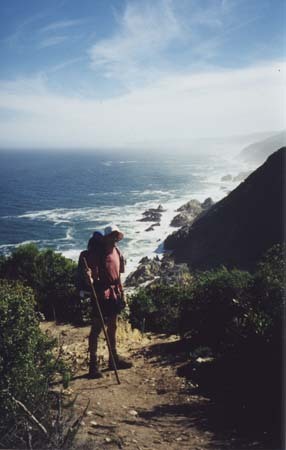 The bush areas atop the headlands are mostly covered with Feinbos (brush with small colorful flowers) and protea (large red flowers). We didn't see much wildlife; In particular, there was very little tidepool life. We saw lots of otter prints on the beaches, but no otters. Sandy and Dawn saw a lourie (large exotic crested bird). The first day we saw two whales (probably a mother and calf) spouting a mile or two out to sea. Elise was plagued by mosquitoes, but not me (she attributes this to blood type). The trail is marked by large yellow otter footprints, spray-painted onto whatever is available (rocks, trees). At the end of each day's hike there are sleeping huts. These are all sea-level, in lovely coves. The roofs of the huts drain into huge rainwater tanks, usable for drinking and washing. Each hut has two 3-level bunks with foam mattresses. Mark and Dawn dragged their mattresses outside and slept there. Each site has a flush toilet, and the outhouse is situated in a prominent place and has a large window with an optimal view. Hence using the toilet became known as 'ascending the throne'. Each hut has a fire area, a firewood bin, and a trash can. Using access trails, rangers keep the wood bin supplied and remove trash every few days. So all the tedious aspects of backpacking are eliminated; it's almost posh. The trail has some hard parts. The valley walls are quite steep; large steps are formed naturally by rocks or tree roots, and occasionally man-made using logs. Along the sea the path crosses fields of loose boulders and cuts across steep rock slopes. The combination of wet rock and heavy, unbalanced packs makes these parts treacherous. Each day covered only a few miles - day 4 was 8 miles, the others about 5 - but between the rigors of the trail and our desire to explore its side-attractions, we ended up arriving at each camp around sundown, and I for one was dog-tired at the end of each day. Tony had made walking sticks for us. The up/down nature of the trail caused a lot of pounding and stress on my lower back, and for the first 2 days I was getting nerve pain. Then I discovered how to use the walking stick like a 3rd leg on hills: planting it in front, then using my upper-body muscles to pull myself up or lower myself down. After this I was totally free of back problems. I mentally thanked Tony about a million times. 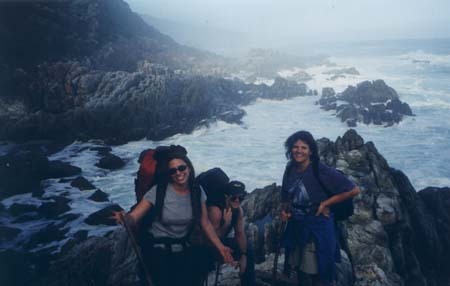 Elise and Carene had done no significant hiking and were quite worried about their ability to finish the trail. Elise has back problems, and her friends had laughed derisively when she mentioned wanting to do the Otter. Mark carried part of Elise's load. In the end, Elise and Carene had no problems and in fact were among the strongest of us. Dawn was a bit weak and wobbly at first; after repacking and shifting some weight to Elise, she did better. Mark contracted a stomach malady on the 3rd day. Fortunately, Elise and Di had packed extensive collections of pain-relievers, muscle relaxants, anti-diarrhea pills, etc. Mark took lots of each, and was better by the end of day 4. Elise and I brought meat for Braai the first 2 dinners: chicken and wurst, then lamb. This was a bad idea: heavy to carry, and heavy in the stomach (though the grilled lamb was quite delicious). After that we had dehydrated trail meals, some of which (e.g. beef stroganoff) were pretty good. Crunchy fresh vegetables (celery, cucumber) were a good idea. Mark and Dawn favored buying standard dried food. Cheaper, but often had to be cooked a long time (e.g., rice). Their store-bought macaroni and cheese was an unmitigated disaster. Mark and Dawn had lots of fine-ground Peet's coffee, and they filtered large mugs each morning, sweetened with condensed milk - highly recommended. We all had oatmeal and/or granola for breakfast. Lunch was a snack of bread, cheese, and candy. 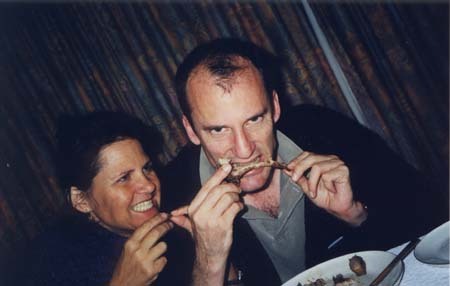 In general we needed less food then what we brought. Several of our party brought generic wine in paper cartons (bad). Di had a plastic bottle of port, of which I drank a goodly amount. Shorts and T-shirt were fine while hiking. 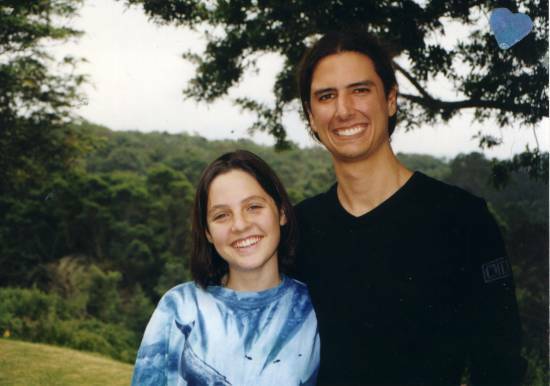 I had a pair of jeans and a fleece jacket for camp-wear, and that was perfect. I brought several pairs of socks, but the fluffy green ones I started in never got even slightly damp or smelly - some kind of miracle - so I wore them the whole way. Elise had expensive new hiking boots, which she liked so much she wore them even in the hut. Elise and I had paper-thin sleeping bags, which were woefully inadequate (it got down into the 40s at night) but by wearing full clothing we survived OK.
4/24: Mostly rocky trail. We stop at a large open waterfall. In spite of a gloomy forecast, the weather is gloriously sunny. 4/25: We come to a deep, narrow gorge in which the stream is deep, black and cold. 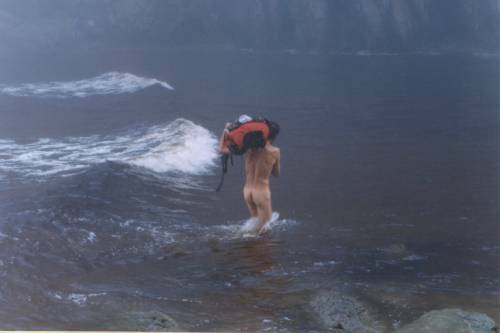 Richard and Mark swim upstream several hundred yards, going through terraced pools and waterfalls. 4/26: Next to the cliff is a rock tower. Elise and I explore; there is a narrow rock bridge one can clamber across, and we summit the tower. The tower is made entirely of snow-white quartz. 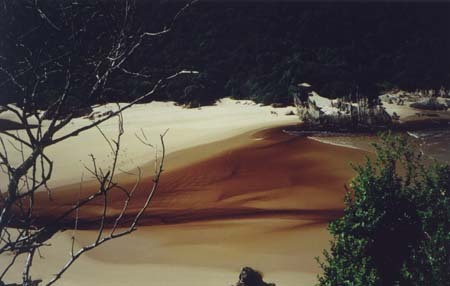 Flowing into the ocean, a stream forms a huge sandy delta with large calm pool, highlighting the ruby/brown color of the water. Mark and I skip rocks in the pool. While walking I try to reconstruct, in my mind, the text of 'Casey at the Bat', and 'The Shooting of Dan McGrew' and 'The Reckoning' by Robert Service. I succeed, but never get the opportunity to recite at the campfire. 4/27: The longest and hardest day. When we reach the Bloekrantz the tide is coming in. 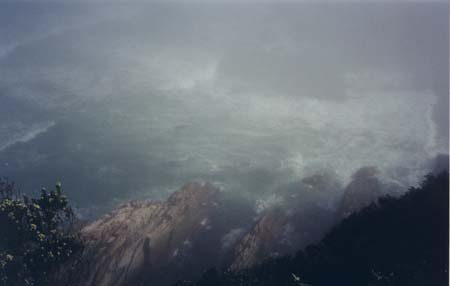 The river is waist-deep and about 100' wide, with waves sweeping in from the sea. I take off my boots and splash across, then come back to carry Elise's pack across on my head. Pik, in the altogether, ferries other packs. Everyone makes it across OK. The other side is all razor-sharp rock, and the water is too deep to walk around. So we climb up a near-vertical ravine - technical rock-climbing that is especially hard with a pack. I foolishly volunteer to carry Elise's walking stick, so I have only one free hand. At several points, with no apparent hand- or foot-hold available, I experience some panic, but somehow I keep going and make it up. Pik, with spider-like agility, zips up and down helping other people. (Side note: farther upstream, the gorge is about 1500 feet deep, and the world's highest bungee jump is there (about 800 feet)). Earlier in the day, Sandy loses the trail and wanders up a cliff for about 30 minutes. She is scared and semi-panicked. She finally finds the trail again, and when she catches up to Dawn they had a good cry together. She's irrationally angry at Andre, whom she had instructed to go on ahead and not wait for her. My highlight: walking along briskly, concentrating on my footing, I walk full-force into a low-hanging branch, which whacks me on the forehead. I stop, stunned, for a few seconds, and am bruised but OK.
Carene and Richard, who need to return to school, take an exit trail out. Where they turn off they leave the word 'BYE' spelled out in white stones on the path. Other path inscriptions (from Sandy, I think): 'Good Grief' along a seemingly endless hill, and 'Hooray' at the crest of the hill. We are still walking (atop a bluff) when the sun sets. Elise is dallying, I am hasty and worried. We come to a pile of firewood; a sign says we need to carry in our own. So Elise and I grab an armful. The final downhill is brutally steep, and doing it in near-darkness, while balancing 6 logs under one arm, is ludicrously difficult. We reach the huts, and find (of course) that there is already a large supply of wood. Then, feeling like Anatoli Boukreev, I grab a flashlight and head back up the hill to assist Sandy, Mark and Dawn. 4/28: Cresting a final ridge, we are stunned by the sight of a golden beach hundreds of feet below us, stretching for 10 or 15 miles. This is Nature's Bay, the end of the hike. We walk on the beach for a mile or so, arriving at a parking lot where Pik and the others have arrived earlier, and are shuttling our cars back from the trailhead. We all feel wonderful. Elise is thrilled at finishing, and intends to start doing more hiking with her daughters. For Mark and Dawn, it's a great start to their 4-month stay in Africa. There's a bit of sadness that our happy group is dissolving, but we all feel that 5 days was the perfect duration - we're energized and eager to return to our normal lives, and to the comforts of civilization.